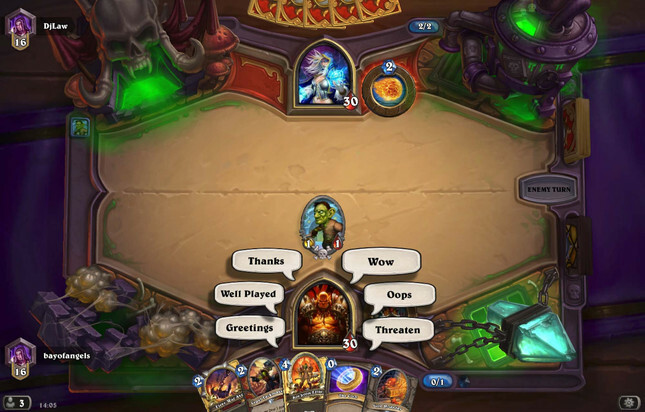 There’ll be no more apologising in Hearthstone, because Blizzard has removed the game’s “sorry” button. Actually, given that most players use the button to deploy sarcastic apologies, I should have put “apologising” in quotes in that sentence. My deepest, sincerest apologies for the mix-up. I’m really very sorry. In place of “Sorry” is a “Wow” button. Pressing this has your character say “astonishing!”, “incredible!”, and other things I was too lazy to research (sorry). The wow emotes do sound sincere, though. The change comes as part of Hearthstone’s 5.0 patch, which – among other things – nerfs a few cards to rebalance things before new expansion Whispers of the Old Gods goes live.